Even leaf tobacco is not strong enough for them, some of them. So they mixed it with different kinds. And when they smoke it, you can’t be on the inside. Some people walk out, you know, it’s so strong. But still, then they live over one hundred years, even though the tongue is just brown. Strong leaf tobacco imported by the Hudson’s Bay Company was a significant trade item on the Yukon River by the 1840s. Athabascan residents used it as snuff, mixed it with burned tree fungus for chewing, and smoked it in pipes. 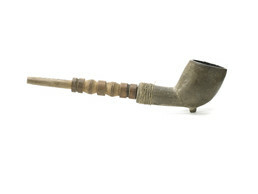 This pipe from the Koyukon village of Nulato has a kaolin clay bowl, factory-made in England for the Indian trade in America.